In 1991 San Marcos Growers planted a yarrow (Achillea millefolium) lawn west of our sales office and for many years this lawn served as a demonstation of a lawn replacement planting that was both attractive and required less care than a turf grass. A detailed description of this lawn with its cultural requirements can be found on our Yarrow Lawn Page. As the Coast Live Oak trees surrounding our office grew larger, the yarrow lawn became more heavily shaded and also experienced intense gopher damage. In 2005 the decision was made to renovate the area in preparation for our fall Field Day (an open house for customers). This work was also prompted by the needs of the Horticulture Dept of the Santa Barbara City College. A course titled Landscape Construction (EH 105) needed a site to contruct a garden and the instructor Dave Frantz of David Michael Frantz Landscaping & Irrigation, contacted the nursery to see if we were interested in having his landscape construction class install a water garden on the nursery grounds. As San Marcos Growers is the leading wholeasale supplier of aquatic plants for the area and needed to renovate the old yarrow lawn, this was a perfect fit. The Landscape Construction Class made its first working visit to the nursery on June 23, 2005. They first met with their client, Randy Baldwin (General Manager of San Marcos Growers). At this first "client meeting" the students discussed the pond's shape and what type of pond the nursery wanted. 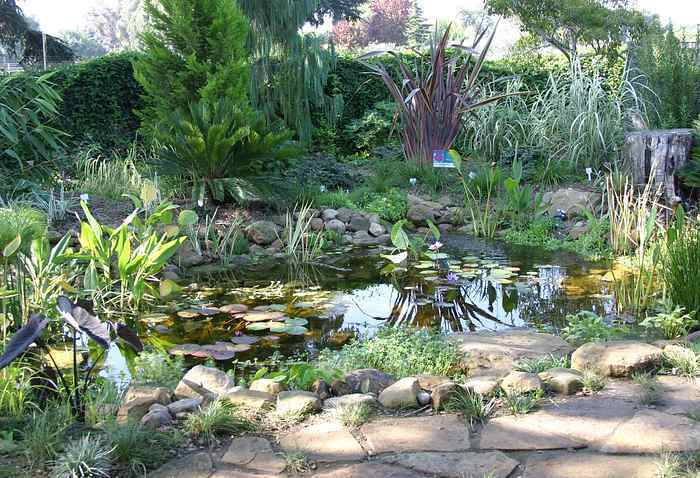 Randy explained that we wanted a pond that was not too big but would maximize the sunniest areas of the space and provide a separate area where Egyptian Lotus (Nelumbo nucifera) could grow. He also noted that it was not his desire to have a stream or water fall tumbling into the pond. Dave Frantz and his class laid out a natural shape that would include some inlet areas and a separate bay for the Lotus plants. This lotus area would have a shallow dam so the rhizomes of the aggressive lotus would not spread to the rest of the pond. To maximize the sunlight in the area the pond was positioned as far away from the existing oak trees which were also limbed up and pruned. The class would return for 3 more sessions to complete the installation. Their progress can be seen in the following images.